Greek Masks, Abolitionists’ Trunks, Salamanders, Entrepreneurship, Virtual Reality and a New Elementary STEAM Innovation Lab! HD-200 Harmony Director and compatible speaker system for use with all Instrumental classes at CCHS, including Orchestra, Repertory Band, Concert Band and Jazz Band. The idea was born at the 2016 American Meteorological Society conference. 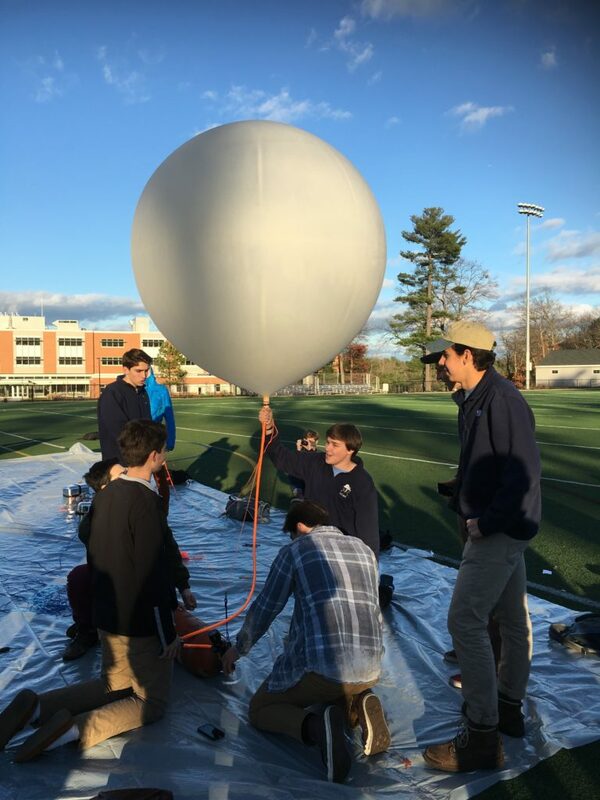 Theresa Ruggiero, Earth Science and Meteorology teacher at Concord Carlisle High School, and her Weather Club students, saw an academic poster presentation describing an educationally-focused Weather Balloon launching and immediately realized this would be an amazing learning experience for CCHS students to undertake. Upon return to Concord, Theresa set out exploring options and researching companies that would provide the materials and insight to make an educationally focused Weather Balloon launch a reality for the Weather Club, and Meteorology and Earth Science students. After learning of the cost to get the project off the ground, she turned to the Concord Education Fund (CEF) for assistance by submitting a grant proposal in early 2016. 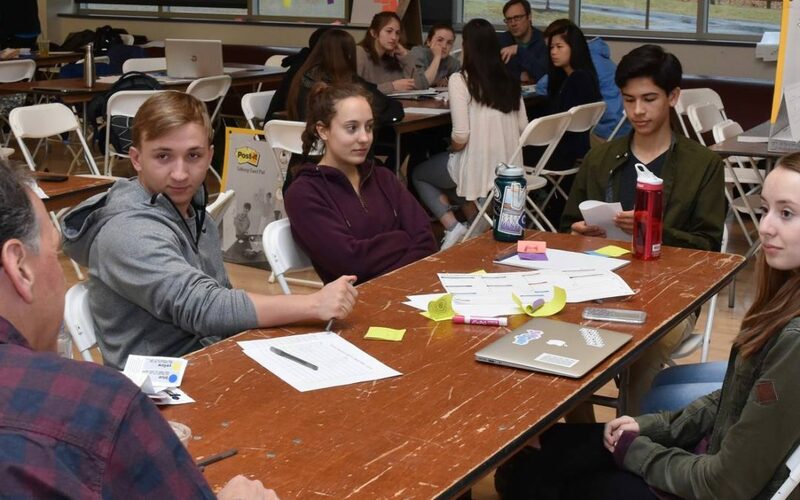 CEF immediately recognized the unique learning experience this project would present for CCHS students and the community at large, and elected to fund the project in the spring, along with a broad mix of others innovative projects. During the summer months, Theresa conducted due diligence and held conversations with a number of companies, finally settling on Stratostar. With all of the supplies on hand by October of the 2016 school year, and with the help of Ned Roos and Stephan Lane, teachers who are also involved in the Weather Club’s activities, she organized the Weather Club student volunteers into groups working on different aspects of the project like building the payload, doing outreach to Earth Science students to help them design experiments, working with the Meteorology students to do Jetstream and weather forecasts to predict launch positioning and recovery, developing outreach and publicity materials, and preparing to run the launch and do the recovery. Her dedication, and the many hours of preparation invested by her students, enabled the team to ready the project for testing. 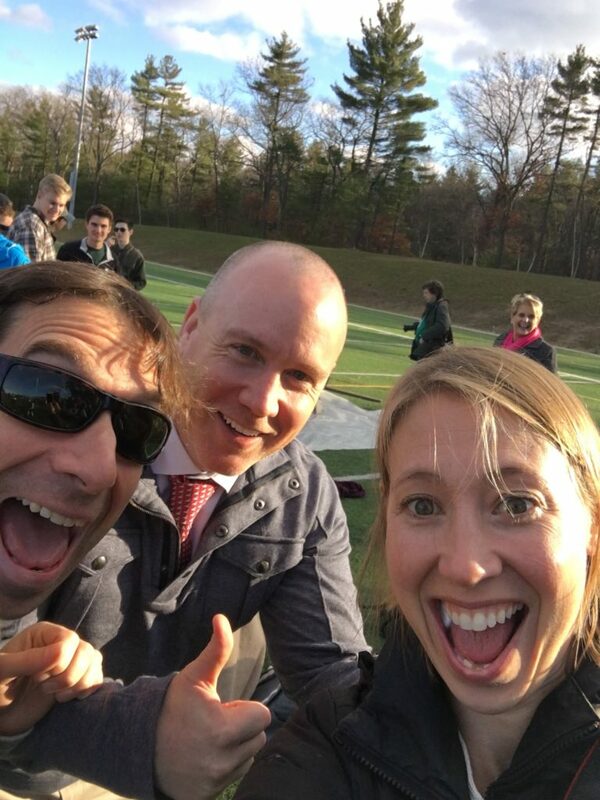 On Friday, December 2, 2016, a large number of students, as well as many school faculty and administrators, including the Principal, Superintendent and K-12 science curriculum specialist, assembled to witness the test launch held at the CCHS turf fields. Thanks to the work of the publicity team, both local newspapers as well as the school newspaper had representatives at the test launch. With music playing and an eager audience watching, the students opened the helium tank valve and inflated the balloon to its desired size (about 12’ in diameter), properly attached the parachute and the 3 cargo boxes housing the experiments, sensors and cameras that would record the entire flight. The SatCom unit was triggered, the sensors were connected and students practiced the controlled launch procedure (necessary when winds are high) from under a tarp using a tether to bring the balloon back down for a second trial launch. With a successful test run under their belts, Theresa and her Weather Club team determined that they were ready to launch the following day, despite a difficult weather prediction at the chosen launch site of up to 15 mph winds and the possibility of snow. On December 3rd, two separate teams of students were assembled: a launch crew and a recovery crew. Based on a variety of weather conditions, most notably the location and speed of the Jetstream, specific launch and predicted recovery coordinates were calculated. The FAA was notified of a 10am launch. The launch crew loaded all of the gear into their transport vehicles at 6:45am and began the 3 hour drive north to Bennington, VT. The entire launch was shared live via Facebook and followed by students and community members from afar. 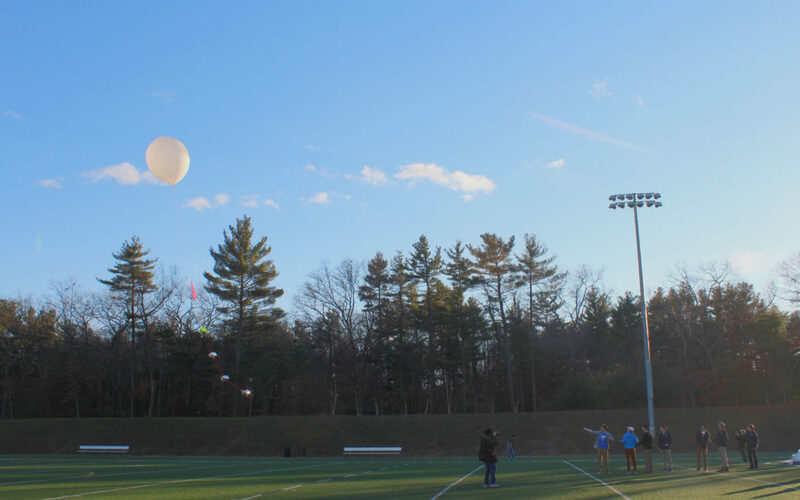 Later that morning, accompanied by CCHS earth science teacher Ray Pavlik, the recovery team headed out to the Worcester area to prepare to recover the instruments and other equipment that would reach the ground roughly 30 minutes after the balloon popped at the edge of space. 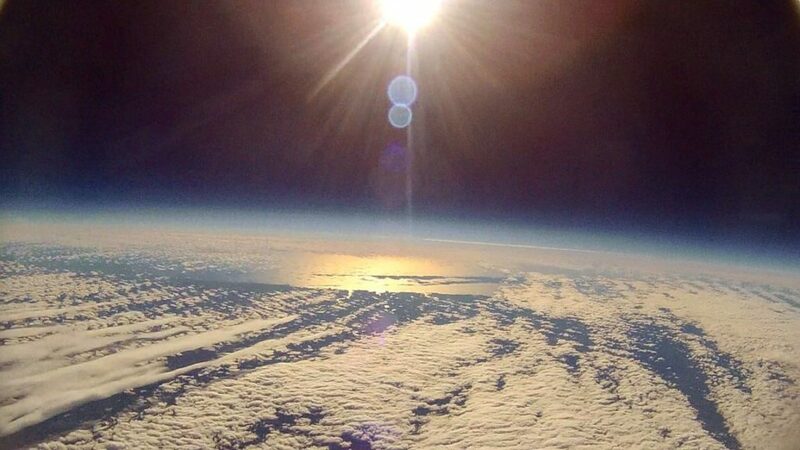 The ariel photo was taken onboard the balloon as it neared its remarkable maximum height of 93,000 feet before bursting from the extremely low air pressure. If you look closely you can see the forks of Long island in the distance. At this altitude, there is so little air that the sky looks black and breathing would be impossible. There are no clouds or life. This is nearly 3 times higher than airplanes fly – it is the edge of space with 99% of the molecules of gas that make up our atmosphere lying below. After the balloon popped, the 3 boxes containing all of the instrumentation, cameras, GPS trackers and experiments plummeted turbulently and rapidly through the thin atmosphere until there was enough air to catch the parachute and open it. Within a few minutes the boxes were travelling through the Jetstream again and the instruments recorded the extremely high 120 mph wind speeds of this upper level wind system. 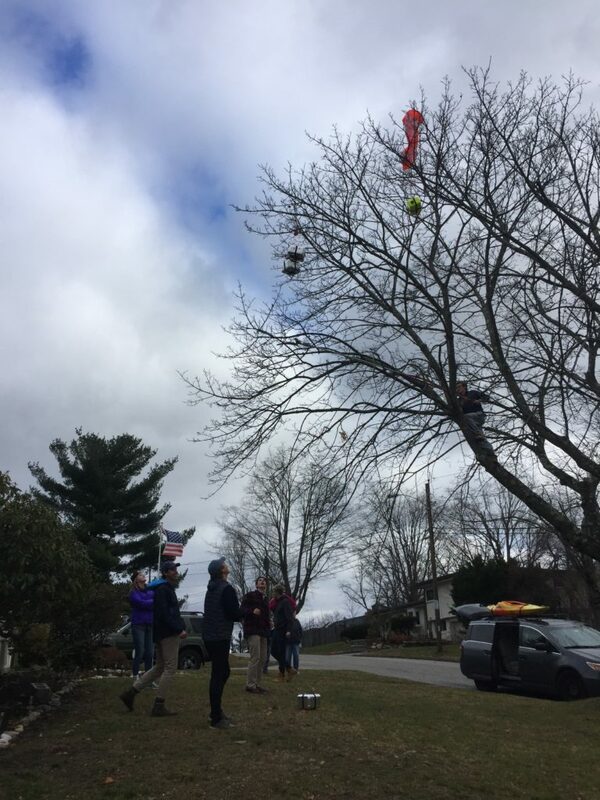 Within 20 minutes, the boxes had landed near the Worcester airport, entangled in the branches of a residential neighborhood tree. The recovery team was on-site within minutes and used their tree trimming equipment and climbing skills to recover the valuable payload boxes. Charlie Peachy, a CCHS Junior who became interested in meteorology as a college major after joining the Weather Balloon launch team this year, organized team members to visit 15 Concord elementary and middle school classrooms to share the video footage and data collected on the launch and inspire them to become involved. In January 2017, a year after the original idea was born, Theresa Ruggiero, Steve Lane, and Ned Roos, travelled back to the yearly American Meteorological Society conference with 5 of the students most involved with the launch: Bentley Meyer, Jalen Winstanly, Cooper Ernst, Charlie Peachy, and Peter Mushlitz. There the students attended sessions held by high-level meteorologists from around the world and had a chance to present their own work, getting a taste of what it’s like to be a part of the real scientific community. While there, they met another group of students who presented their work on building and programming a weather station. 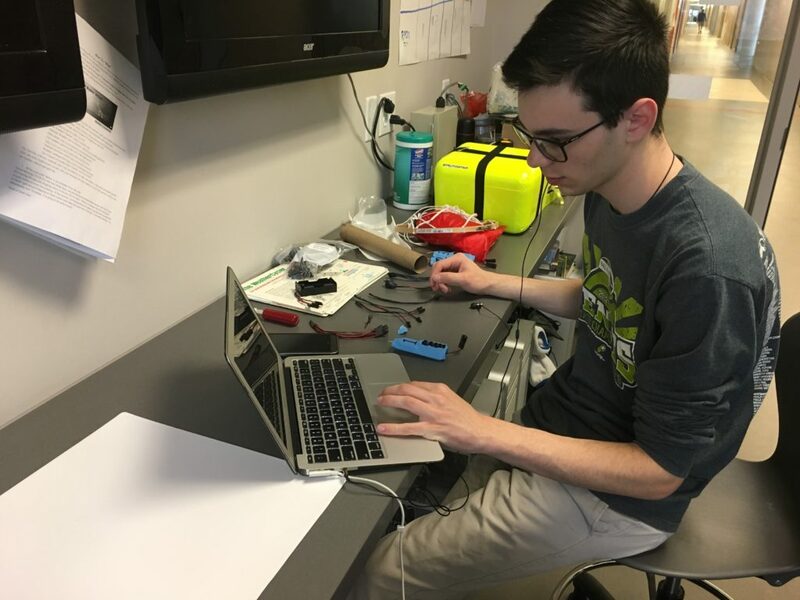 The two groups of students are planning to collaborate and re-design the weather station to be fit for flight on next year’s balloon launch, which is planned for October, 2017.